New Bed = New Bedroom Design! Since the furniture is heavy looking, I tried to lighten it with crystals, mirrors and other light accessories. I could pick so many different rugs but I think this one works well with the light and dark together. I love my new fabric! I will post pictures when room is complete. Soon I hope! Any other suggestions my friends? I would love to hear your ideas. I think a styled vignette on the nightstand makes the bedroom look more polished and pulled together. Do you agree? Do you decorate your nightstands? It’s not as easy as it looks, is it? I hope these photos have given you some ideas and inspiration. I just love looking through these beautiful pictures, don’t you? Yesterday afternoon, my daughter and I went to the Winsmith Mill Market in Norwood, MA. I had been anxious to go and check it out since I read my friend Susan at Country Design Home posted here where she had visited the mills and wrote what a great place to check out. It was so fun poking through everything. I don’t know why we got the biggest kick out of that ‘well loved’ horse! Sheryl Rose is all about making a deal and she sold me this vase with the flowers also for only $20.00! Pretty good, huh? So very pretty! I ended up buying an old crate also for only $5.00! And lots of her penny candy too! You will have to go and check out all the stores if possible. Here is where you can get directions and hours (which is only open Friday, Saturday and Sundays). Such a fun day! I will share more soon. Did you get in any fun shopping this weekend? How Important is LRV When Choosing A Paint Color? Recently a reader wrote and asked if I would explain what the LRV number was on the paint strip samples and wondered how to use that number when selecting a paint color. The definition of Light Reflectance Value (LRV) is the total quantity of visible and useable light reflected by a surface in all directions and at all wavelengths when illuminated by a light source. (source) What does that mean?? Simply, it means the LRV number is to be used as a guideline for predicting how light or dark a color will look and feel once up on the walls. LRV is a measurement that tells you how much light a color reflects, and also how much it absorbs. LRV runs on a scale from 0% to 100%. Zero assumed to be an absolute black and 100% being an assumed perfectly reflective white. The colors from top to bottom are Benjamin Moore 2087-70 Elephant Pink, 2079-60 Pink Cherub, 2079-40 Springtime Bloom, 2079-30 Peony and 2079-10 Candy Cane Red. Beautifully demonstrated high to low LRV. LRV is also used by lighting designers to calculate the number and type of light fixtures needed to give a certain amount of light for interior spaces. They use this LRV number as data to help figure out how many lights and types of lighting that will be needed in the room. The lower the LRV paint number, the more lights that will be needed in the space. Well I hope I have helped explain what LRV stands for and how it can be useful when choosing a paint color. Another good tip to remember is to be sure that the LRV values are close in number when painting adjacent rooms so there will be good color flow. Lori Sawaya, Color Expert and Strategist has a great video that helps explain LRV –here. Benjamin Moore offers a free online class-Paint Color & Lighting—An Online Color Theory Class if you want to learn even more! If you need help choosing paint colors for your home, contact me today. Have you noticed how widespread using dark trim for windows is becoming? They seem to be becoming more popular in all different parts of the country. But for many people, the very idea of using black window frames in a bright windowed room runs counter to everything we think of when it comes to a bright room. Verses a wrought iron fence. The white stands out and the black seems to disappear into the plantings. Do you think the white stops the eye, whereas the dark color just disappears? Very stunning and beautiful, don’t you agree? I do think the eye passes through easier with the darker trim. Which look do you love best, the dark or the light window trim? The above photos highlight an understated green with grey tones (or an understated grey with green undertones). Again, this color can be classified as a green with grey undertones, or a gray with green undertones. The color looks dark in the Ben Moore fan deck, but as you can see above, the brighter the room, the lighter the color will look. Another greenish gray color, Gray Mirage is a favorite neutral of Candace Olson. Did you notice that all of these greens are cooler greens (not warm)? Camouflage is a pretty, very beige-green color. A couple of my favorite greens right now? A beautiful color with stained trim and darker furniture. Agave works very well with oak cabinets! Have you used any of these best selling greens lately? What is one of your favorite greens to use? 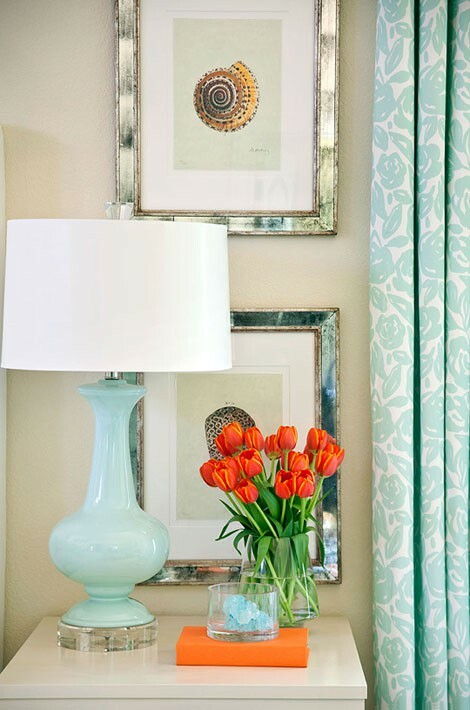 To see all of the greens and all of their other colors, visit Benjamin Moore’s Color Gallery.